Research, Health; Health System Plan; Strategic Planning. Health care delivery in Oman has attained great heights since the modern renaissance in 1970. Although the health service had the main impetus all these years, the importance of health research began to take place by mid 1990’s and is now gaining momentum as an important responsibility and activity of the Ministry of Health (MoH). Although there has been progressively increasing investment and commitment to research activities in the recent Five Year Plan for Health Development, it still lags behind in the quality and quantity of research output. Lack of factors like adequate infrastructure, dedicated human resources, empowerment of existing systems, and societal support for research have adversely affected research output. Centre of Studies and Research in MoH has proposed a strategic plan, the ‘Health Vision 2050 for Health Research’ with aim of making Oman the regional leader and a research hub of world standards in health research. The mission is to promote, facilitate, and conduct high quality health research addressing national health priorities to improve health care services and enhance the efficiency and effectiveness of the health system, reduce health inequity, and contribute to socioeconomic development. The strategy includes setting health research priorities, strengthening the health research capacity, defining and implementing norms and standards, developing health research (quality and quantity), translating evidence into policy, strategy and practice, monitoring and coordinating research, financing health research, and evaluating the effectiveness of the health research system. It should generate a multifold increase in the quality and quantity of health research in Oman, positively impacting the health system and health care service. Research improves health in three main ways. Firstly, it results in the development of new and better interventions in the form of both medical products (e.g., drugs, vaccines, diagnostics, and devices) and improved processes to strengthen health service delivery, ultimately contributing to universal coverage with essential health care. Secondly, it informs the development of effective policies and practices. Finally, it empowers people and individuals to internalize knowledge and practice health behaviors in their daily lives. Knowledge and research alone are insufficient to be a force of change without two other critical components, namely, political commitment and social movement. Health research can be classified into two broad categories: disease specific and risk factors health research, which mainly includes biomedical, public health, environmental health, social sciences and behavioral, and science and technology research; and non-disease specific health research (health system research) in which the main focus is on the health system processes, and outputs from the point of view of the system provider. Health systems research can be defined as the type of research that addresses the six building blocks (service delivery, information support, leadership and governance, health workforce, financing, and health technology) of the health system and policy issues that are not disease-specific but concerns systems problems that have repercussions on the performance of the health system as a whole.3−5 Health systems research exists to improve the quality of health service delivery. WHO has identified four key building blocks to strengthen research in countries.7 This was summarized as setting research priorities based on health needs, strengthening research through capacity building, practicing research with high standards, and translation of evidence from research into policy and practice. The interplay of these factors is shown in Figure 1. Health research system (HRS) is a system for planning, coordinating, monitoring and managing health research resources and activities, and for promoting research for effective and equitable national health development.8 The definition of HRS proposed by the WHO is: “The people, institutions and activities whose aim is to generate detailed and reliable knowledge that will be used to promote, restore or maintain the health status of populations.”6 HRS improves the health of the community by enhancing the efficiency and the effectiveness of the health system, this impacts the overall process of socioeconomic development. The health system, education system, and science and technology system are all interlinked with the HRS of a country. These systems are affected by the historical, political, ideological, socioeconomic, geographical, and cultural factors at play in the country.8 The communication of these systems with each other and with the environment ultimately defines the HRS, which influences the global research community. In low/middle income countries, health research is uncoordinated and fragmented resulting in inefficiencies and repetition. Some research requires cooperation and linkages between different research organizations or disciplines. In low/middle income countries, research is insufficiently linked to the priorities and objectives of the health system. Many research outputs are not sufficiently translated into changes in the health system or into the expected health and equity outcomes. A systems approach is required to advance research capacity and to mobilize resources for research and development. In low/middle income countries, it is sometime unethical, biased, unaccountable, and obscured. The ultimate aim of health research in any country is to improve the health and wellbeing of its population by employing the best available and evidence-based health system and practices. Since the modern renaissance in Oman in 1970, great emphasis has been laid on health service. From the beginning, primary health care was in the forefront and well directed efforts were made to improve health and mitigate preventable diseases, especially communicable diseases. Within a short span of two decades, many communicable and vaccine preventable diseases were controlled. Currently, key performance indicators of health like life expectancy at birth, infant and childhood mortality rates, maternal mortality rates, immunization coverage, and incidence rates of several communicable diseases are comparable to developed countries.12,13 This was achieved through the rapid and widespread installation of health infrastructure and service inputs, commitment of the stake holders, dedicated services of the health care providers, and the participation of the community. Indigenous research would have played only little role at this stage as most of the research done during these decades were mainly cross-sectional studies, surveys, and descriptive studies to estimate the magnitude of health problems in Oman. The strategy at this time was to become at par with the advancing nations on healthcare and to make up the lost time. The health component of the initial Five Year Plans were all geared to this end. By the early 1990s, a lot were achieved in the health service sector and a consolidation phase was reached. The National Health Policy promulgated in November 1992 brought out a 12 point strategic plan to consolidate the achievements of the previous two decades and plan the way forward.12 Although enhancing health research was still not envisaged in this document, by the end of the century, health research was introduced as an important facet of health service in the subsequent Five Year Plans. During the initial three decades, findings of research done in other developing and developed countries were adapted to the local situation rather than foster in-house research. The few research that originated in Oman were the outcome of health care personnel doing research out of their personal interest or their perceived health needs in the community rather than due to an organized or structured agenda and much less a mandatory requirement or priorities of the health sector. Even then, most of the published research originated from Sultan Qaboos University (SQU) than the Ministry of Health (MoH). Having realized the importance of maintaining a proper health information system, an excellent system of case record keeping was initiated by the MoH since early 1970. International Coding of Diseases (ICDs) of all morbidity and mortality occurring in the health facilities were accurately maintained and was made accessible to health managers, service providers, and researchers alike. The data are summarized and published annually as the Annual Health Report since 1984 and which are available online at the MoH website www.moh.gov.om. At the end of the last century, these records began to be computerized and by 2010, most health institutions have a fully computerized health information system. This has proved to be an enormous boon to launch into research activities pertaining to health disorders, health service, and health care delivery. During the 1990s, Omani doctors started graduating from SQU and so were nursing and other paramedical graduates from various health professional training institutes in Oman. Omani postgraduates trained in higher specialties were also returning to Oman from other countries where research was an integral part of their training and professional work. This fact, coupled with the realization that “imported” research findings and policy guidelines are not always applicable to the specific situation in Oman, made it necessary to move towards developing a culture of doing health research to resolve some of the specific health problems and promote health in the local context. The emphasis on research in the subsequent Five Year Plans, the changing pattern of disease burden from communicable to non-communicable diseases, the appreciation by the stakeholders that research is a critical component of health service, and the inclination of the health service providers in the MoH to be involved in research has come to the forefront by the current decade. Oman strives to be the regional hub of research and innovation covering a wide array of disciplines ranging from biological and health sciences to engineering, social sciences, humanities, and economics bearing in mind the strong social and cultural integrity of the country. The avenues for research in Oman originated from different ministries of the government (such as the MoH), private and governmental universities (such as Sohar and Nizwa University), research funding bodies such as The Research Council (TRC), and non-governmental organizations like the Environment Society of Oman. Health research in particular is not only conducted by the MoH but also by other institutions linked with medicine and health sciences (e.g., SQU, Nizwa University, Sohar University, etc.). Health research publications (quantity and quality). peer-reviewed journals are not reflecting all the research output. Table 1 shows the overall publications in medicine, where Oman ranks ninth among the 15 countries in the region.14 The number of research published are quite low compared to other countries in the region. Table 1: The overall publications in medicine in some countries. On comparison across countries for the period of 1970 to 201015 the average number of publications per million population (PPMP), gross domestic product (GDP), and physicians per 100 publications, Oman was trailing behind on all three indicators. Translation of health research into policy and practice is an issue that should also be taken into consideration as a measure of the success of any research organization. Until now the translation of research finding into policy in Oman has been limited. There has to be a system and process by which good quality research done within the country is translated into policies and operationalized for the benefit of the population. 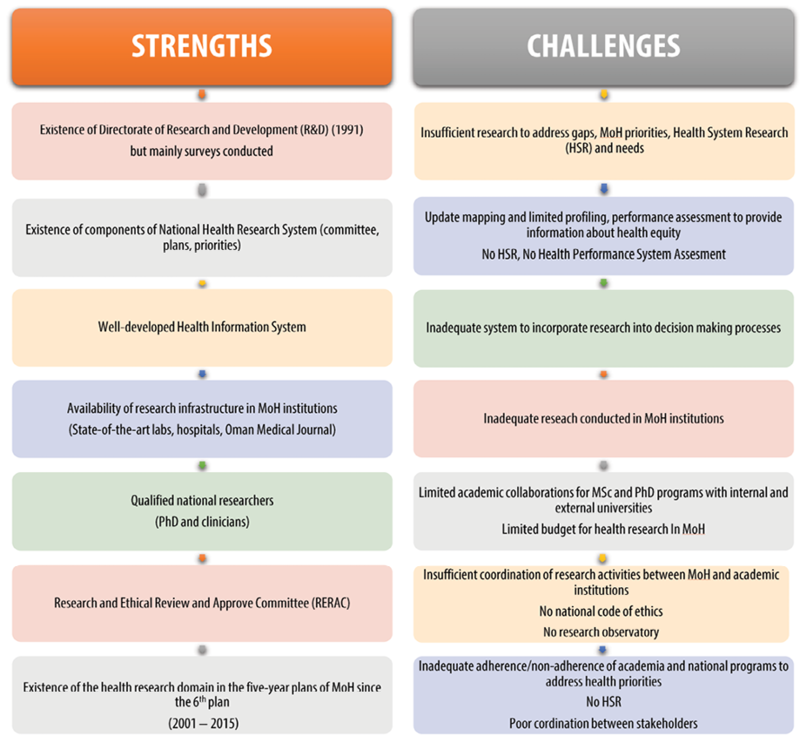 Figure 3: A summary of the strength and challenges of health research in Oman. Oman is striving to become a country with high quality research. The most important challenge is to ensure the translation of research results into healthcare measure and policies by reducing frictions between research cultures, bridging gaps, overcoming existing hurdles, and taking into account the social, cultura and ethical values, thereby fostering more interdisciplinary cooperation. In developed countries like Germany, the HRS is primarily based on pooling expertise, decentralized structure, collaboration, and funding.22 In developing countries like South Africa, HRS is influenced by the political environment while in Cuba, the HRS is decentralized and based on national priorities (based on morbidity and mortality data). Thailand is in the process of reforming its HRS while Malaysia has better governance, coordination, and harmonization. The experience of developing countries like Thailand and Malaysia can be useful to Oman for identifying ways to enhance the system and avoiding the pitfalls. For example, Thailand’s experience identified some problems like inefficient fund management, inadequate investment in research, lack of common goals, and long proposal processing time.24 These could also happen in Oman unless there is an efficient management system, competent monitoring process, and dedicated personnel. In 2010, Oman celebrated 40 years of modern renaissance. While looking back and celebrating its achievements, it was natural to think ahead and plan where Oman should be in the next 40 years. The MoH took this up as a challenge and wanted to plan ahead to 2050. Health Vision 2050 became a concept that needed to be addressed. Hence during the eighth five-year plan (started in 2011) a task force was set up to prepare a strategic plan for the Health Vision 2050. A steering committee was constituted and the process of developing this vision was through a series of well-planned scientific activities. Fourteen working groups of national and international experts were constituted. Each of them was directed to develop a detailed strategic study in one of the domains of the health system, discuss challenges, and consider their own future perspective.13 Strategic studies were carried out on 24 health domains of evolving importance and health research was one of these domains.13 Oman Health Vision 2050, an international conference, was held in May 2012 in which the draft of all the strategic plans were presented. Then, came the task of preparing the Health Vision 2050 document for each of the 24 domains. The first edition of the main document was published in May 2014 and can be viewed on the MoH website.13 The Health Vision 2050 for health research was submitted in July 2014. The primary vision in the plan for health research is for Oman to be a regional leader and a research hub of world standards in health research for a healthier nation. Its mission is to promote, facilitate, and conduct high quality health research in Oman addressing national health priorities to improve the healthcare services, enhance the efficiency and effectiveness of the health system, reduce health inequity, and contribute to socioeconomic developments. Strategy 1: Setting health research priorities. 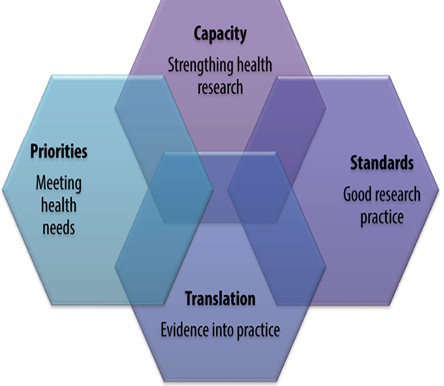 Strategy 2: Strengthening health research capacity. Strategy 3: Defining and implementing norms and standards. Strategy 4: Developing health research (quality and quantity). Strategy 5: Translating evidence into policy and practice. Strategy 7: Financing health research. Strategy 8: Evaluating effectiveness of the HRS. An ancient Chinese philosopher once said: “A journey of a 1 000 miles begins with a single step.” Using the same analogy, our journey towards 2050 has to also start with some tentative steps and the earlier the better. Few of the steps taken in this direction to reach the Health Vision 2050 are highlighted in the following section. The plan of the MoH in focusing on health research is consistent with the global strategy to support decision-makers and enhance evidence-based practice. The CSR set the list of health research priorities with regard to the health system research priorities as well as the disease and risk factor priorities. During the development of the health research priorities, the centre also took into account the criteria recommended by the WHO, which are relevance of the problem, avoidance of duplications, feasibility, application of results, urgency of data needed, ethical acceptability, and political acceptance. The setting of our research priorities was based on scientific principles, taking into account the priorities of research emanating from the eighth five-year plan for the development of health, regional research priorities, research priorities recommended by international organizations, and research priorities that serve the Health Vision for 2050. Underlining the importance of cooperation and collaboration between all stakeholders and decision-makers, a workshop was held to present and discuss the priorities at which the director generals, heads of departments, directors of planning, and other experts shared their views and opinions on the research priorities. The list of research priorities was then updated based on the discussion with the stakeholders. This list will be reviewed at the beginning of every five-year plan and revised according to the changing spectrum of the burden of various health-related issues and other relevant factors. Short, intermediate, and long-term goals will be set to achieve these targets. The next updating of the list is already under consideration. Health system research that constitutes service delivery, health workforce, health information system, medical products vaccine and technology, leadership and governance, and financing. Health research related to diseases and risk factors that includes non-communicable diseases,27 congenital anomalies, injuries, problems related to ageing, disabilities and rehabilitation, communicable diseases, perinatal malnutrition, child and maternal health, health promotion, etc. Establishing a CSR, which has a well-defined and unique responsibility at the national level in the conduct and supervision of research, is of prime importance. This was set up and is functional. More information about this centre is available on its website, which was launched in December 2015. All research proposals have to be submitted online to the RERAC. Establishing a research hub of world standards that will coordinate and collaborate with other agencies within Oman, which are also involved in conducting, facilitating, and supervising research in the health field. Training of researchers in research methodology, including a comprehensive understanding of bioethics, biostatistics, health economics, computing, and data management as well as training of trainers so that a critical mass of competent trainees are available to carry on this task. The CSR conducts periodic training in research methodology, biostatistics, bioethics, knowledge translation, and related topics to health professionals. CSR staff also contribute as resource persons at similar workshops and seminars for the Oman Medical Specialty Board (OMSB), Sultan Qaboos University Hospital (SQUH), Institute of Health Science, Oman Medical College, and such like. The website of CSR also has several educational materials for enhancing knowledge in these topics. Enhancement of professional skills by providing continuing medical/professional education (CME) and awarding qualifications in collaboration with academia. Collaborative research as well as training of staff are also being worked out with McMaster University (Toronto, Canada) and Cardiff University (UK). Promoting the social accountability through better engagement of communities in health research, mainly by involvement of members from the community in the policy making bodies for the translation of evidence from research into action plans and policy making. Documenting and archiving the list of all researchers, research proposals, reports and publications, and all aspects related to research. This has already commenced. From March 2016, all research proposals must be submitted online on MoHCSR website. The research proposal form was revised and made more specific for each type of research design. The complete process of research proposal submission, review, approval, follow-up, progress reporting, and final reporting can all be done online. The process is being updated periodically to make it more efficient and user friendly. With this system, dynamic access to ongoing research is available. Studies conducted before online submission are also being archived. Registering clinical trials to inform the decision maker about all of the available evidences. This is available from the MoHCSR website. Many reports showed that original research arising from Gulf Cooperation Council (GCC) counties including Oman is low. MoH is the main health service provider in Oman and hence research on health service and health system needs to emanate significantly from MoH. Research has been introduced as one of the main pillars as per the eighth five year plan. Hence, the MoH should identify measures to increase the quality and quantity of research, implement the feasible options to achieve it, and evaluate the impact of research in modifying health care and health systems. The quantity and quality of research and scientific publication by staff employed by MoH can be strengthened by the following broad set of attributes such as generating motivation to enhance research activity, providing incentive to increase and encourage research, enhancing research skills by training and higher qualification, selecting the right material at recruitment, specifying a career path for research oriented professionals, allotting protected time for research, enhancing electronic clinical record system to be research friendly, and providing easy onsite access to the World Wide Web for researchers and health care providers to access evidence based information. It was pointed out earlier that both the quantity and quality of biomedical health research in Oman was quite dismal.14 However, a study published from Saudi Arabia in 201529 showed that both the quality and quantity of research has significantly improved. According to this study which was based on a retrospective evaluation of 9 222 published studies from the GCC countries, Qatar’s performance was found to be much better followed by Kuwait and Oman. The greatest surge in the number of publication during the study period (2011–2013) was observed in Oman. This study also reported that “although Oman had a comparatively low IF (journal impact factor) in 2011, they recorded a tremendous improvement in successive years”.30 Obviously, this study bears testimony to the improvement in both the quality and quantity in biomedical research in Oman and we are on a trajectory to meet the 2050 Vision if we continue the strategies in place. This implies the translation of research findings into policy and practice guidelines at different levels (strategic, executive, and operational). To achieve this goal we have to start with researchers who have to generate high quality research on priority issues. The decision-makers have to utilize the evidence generated by the researchers by making policies and practice guidelines. This can eventually improve health in the community. Comprehensive website for the CSR to facilitate electronic submission of progress and final reports which can also be used to disseminate news and events of its activities, training opportunities, announcements of national, international and online courses, research reports or published articles using search criteria by disease, topic, author, study type, etc., that links to other professional sites on related topics. Establishing a newsletter and/or medical journal from the CSR. Periodic meeting with policy makers, managers, academia and TRC to disseminate results on the format, periodicity, nature of content, and other specification of the publication. Encouraging researchers to publish their studies in indexed professional journals. Prepare and disseminate policy briefs. Encouraging oral presentation and posters of research at national and international conferences and workshops. Periodic and regular conferences with national and international participants. Access to international web resources to access international journals and citations (Science Direct, PubMed, etc.). Subscription to printed/online scientific journals dealing in research methodology, biostatistics, bioethics, health economics, clinical epidemiology and related journals. Yearly evaluation of progress reports of the CSR. Many of these items were initiated and need to be maintained as well as developed further. Coordinating, networking, and collaborating with other health institutions and academia for the advancement of research capacity. Establishing a Research and Development Observatory that focus on monitoring progress and development, and actively gathering and displaying information about a specific item or topic. The goal of the Research and Development Observatory is to facilitate evidence-informed policy and practice of research for health by providing all relevant information about that item or topic and making it available to stakeholders. Health research is more productive when there is an assured regular availability of funds. A universal mechanism should be established to monitor progress on the financial and technical support provided for health research in developing countries. The CSR has to have a corpus fund for disbursing for approved research. The MoH will have to provide and sustain this fund from its budget as the CSR is not an income generating entity, but is only a service provider and its customers are currently only from MoH. However in the future, by expanding its clientele, some income may be generated from its training program, consultative services, donations from philanthropic individuals and organizations, and even from patents that may come from research funded by the centre. Monitor and evaluate the use of research results by the national control program and its impact on disease burden and health services. Develop a system for detecting and dealing with scientific misconduct. Requesting the receipt of raw data to verify the analysis and/or to carry out an in-depth analysis. Registration of the ethical review committees and randomized controlled clinical trials. Monitoring and validation by local supervisors/administrators. Research has been the corner stone in the development of innovation and technology in the past and will continue to be critical in healthcare not only in improving health and quality of life but also in the appropriate application of newer technology and innovation. In the last 40 years, since the beginning of the modern renaissance in Oman, the role of in-house research in the health field has been low. But this cannot remain so as there is a need to provide evidence-based health care and health delivery that is specific to the local situation. Hence, the quantity and quality of research have to increase in order to remain relevant and in the forefront of healthcare in the coming decades. The MoH through its Health Vision 2050 for health research hope to achieve the vision it has set in its target. It is equally important to adapt to the changing scenarios in health service and with the needed course correction, will meet the evolving need and overcome the challenges of the next 40 years. Knowledge of the past and present problems and challenges enabled us to draw this strategic plan which will hopefully be a corner stone to achieve the 2050 vision for health research. The first few tentative steps have been taken and with dedicated planning and sustained effort, this vision can become a reality. 1. Bowling A. Research methods in health: investigating health and health services. 4th ed. McGraw Hill Education (UK): Open University Press; 2014. 2. World Health Organization. National health research systems: Report of an international workshop. Thailand: Cha-am; 2001. 3. Remme JH, Adam T, Becerra-Posada F, D’Arcangues C, Devlin M, Gardner C, et al. Defining research to improve health systems. PLoS Med 2010 Nov;7(11):e1001000. 4. Kroeger A. Defining health systems research. World Health Forum 1992;13(2-3):193-194. 5. Mills A. Health policy and systems research: defining the terrain; identifying the methods. Health Policy Plan 2012 Jan;27(1):1-7. 6. Barron P, Buthelezi G, Edwards J, Makhanya N, Palmer N. Health systems research: A manual. Health Systems Trust; 1997. 7. World Health Organization. The WHO strategy on research for health. WHO Library Cataloguing-in-Publication Data; 2012. 8. World Health Organization. A study of national health research systems in selected countries of the WHO Eastern Mediterranean Region. Egypt, Islamic Republic of Iran, Morocco, Pakistan and Sudan. Regional Office for the Eastern Mediterranean; 2004. 9. Hanney SR, González Block MA. Why national health research systems matter. Health Res Policy Syst 2008 Jan;6:1. 10. IJsselmuiden C, Matlin S. Why Health Research?. Research for Health: Policy Briefings by Council on Health Research for Development and Global Forum for Health Research; 2005. 11. World Health Organization. Health Research Systems Analysis (HRSA) concepts and indicators [cited 2013 March 14]. Available from: http://www.who.int/rpc/health_research/concepts/en/. 12. Undersecretariat for Planning Affairs. Ministry of health, Oman. Health Atlas – Health Vision 2050, March 2014, 1st Edition [cited 2014 May]. Available from: https://www.moh.gov.om/documents/16506/120542/Health+Atlas/4a611e16-cdb9-4596-9e67-3bd9e2c0126d. 13. Undersecretariat for Planning Affairs. Ministry of Health, Oman. Health Vision 2050, The Main Document May 2014 [cited 2014 May]. Available from: https://www.moh.gov.om/documents/16506/119833/Health+Vision+2050/7b6f40f3-8f93-4397-9fde-34e04026b829. 14. Scimago. SJR - Scimago Journal & Country Rank 2007 [cited 2013 May 14]. Available from: http://www.scimagojr.com/. 15. Al-Maawali A, Al Busadi A, Al-Adawi S. Biomedical publications profile and trends in gulf cooperation council countries. Sultan Qaboos Univ Med J 2012 Feb;12(1):41-47. 16. Rohra DK, Azam SI. Quantitative and Qualitative Analysis of PubMed-Indexed Biomedical Publications in Oman from years 2005-2009. Oman Med J 2011 May;26(3):160-165. 17. Ghannem H, Becerra-Posada F, IJsselmuiden C, Helwa I, de Haan S. National research for health system mapping in 5 countries in the Eastern Mediterranean region and perspectives on strengthening the systems. East Mediterr Health J 2011 Mar;17(3):260-261. 18. Araja D. Health System Research Opportunities for Assessment of The National Health Care System. Value Health 2015 Nov;18(7):A574-A575. 19. Kennedy A, Khoja TA, Abou-Zeid AH, Ghannem H, IJsselmuiden C; WHO-EMRO/COHRED/GCC NHRS Collaborative Group. National health research system mapping in 10 Eastern Mediterranean countries. East Mediterr Health J 2008 May-Jun;14(3):502-517. 20. Al-Riyami A. Health vision 2050 Oman: a committed step towards reforms. Oman Med J 2012 May;27(3):190-191. 21. World Health Organization. Health system profile: Oman. 2015. 22. World Health Summit 2012: National Centres for Health Research: translating results into patient care. Translating Research into Policy. Berlin: 2012. p. 32-34. 23. Hanney S, Kuruvilla S, Soper B, Mays N. Who needs what from a national health research system: lessons from reforms to the English Department of Health’s R&D system. Health Res Policy Syst 2010 May;8:11. 24. The Council on Health Research for Development (COHRED). Funding of Health Research and Development of National Institutes of Health in Malaysia. 2000. 25. Pratt B, Allen KA, Hyder AA. Health Systems Research Consortia and the Promotion of Health Equity in Low and Middle-Income Countries. Dev World Bioeth. 2016; 16(3):148-157. 26. Health Research Priorities. Centre of Studies and Research. Directorate General of Planning and Studies, Ministry of Health, Oman. March 2014 [cited 2014 March]. Available from: http://mohcsr.gov.om/health-research-priorities/. 27. World Health Organization. Noncommunicable Diseases Country Profiles 2011 WHO Global Report. 2011. 28. Health Research Funding Guideline. Centre of Studies and Research. Directorate General of Planning and Studies, Ministry of Health, Oman. March 2014 [cited 2014 March]. Available from: http://mohcsr.gov.om/health-research-funding-guideline/. 29. Guidelines for Responsible Conduct of Clinical Studies & Trials. Centre of Studies and research. Directorate General of Planning and Studies. Ministry of Health, Oman [cited 2016 August]. Available from: http://mohcsr.gov.om/clinical-trials-and-studies-guideline/. 30. Abu-Dawas RB, Mallick MA, Hamadah RE, Kharraz RH, Chamseddin RA, Khan TA, et al. Comparative analysis of quantity and quality of biomedical publications in Gulf Cooperation Council countries from 2011-2013. Saudi Med J 2015 Sep;36(9):1103-1109.